Free Online Conservatory price Quote. We offer the best value DIY Conservatories you'll find anywhere. Our range includes quality designs and features you expect from a diy conservatory supplier. Our powerful online quotation system gives you a Base, Conservatory & Glass Roof Quotation all in one. Get your online quote plus BASE & GLASS ROOF pricing now. FREE 3D & Multi-view Drawings with Every Quote! Design your diy conservatory from the comfort of your own home. 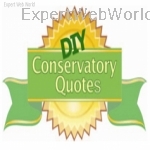 Our website http://www.diyconservatoryquotes.co.uk allows you to design, choose and receive a free no obligation quotation straight to your inbox.Why put up with double glazing salesmen and their high commissions? Who wants pushy salesmen touting what their company sells rather than you selecting what you want at your leisure.